Located 8 miles south of Deep Creek Lake lies Mountain Lake Park, Maryland. 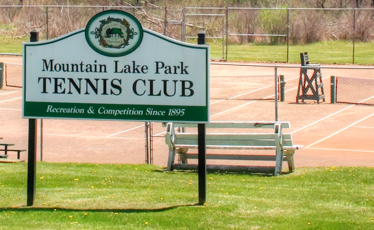 Similar to other neighboring towns, Mountain Lake Park was a popular resort area from the late 1800’s to the 1940’s. A “Chautauqua” style town, Mountain Lake Park stressed the importance of education as well as recreation. Over the years, thousands of visitors have traveled through Mountain Lake Park, such as President William Howard Taft and Mark Twain. Today, the town is filled with Victorian style homes representing the times gone by and over 2,000 residents. It is still a source of recreation, since it neighbors Broadford Lake. When is the best time to visit Mountain Lake Park? The Western Maryland Clay Court Tennis Championships in August! The town has been hosting this event for the past 94 years. For more information about Mountain Lake Park, please visit http://mtnlakepark.org/.